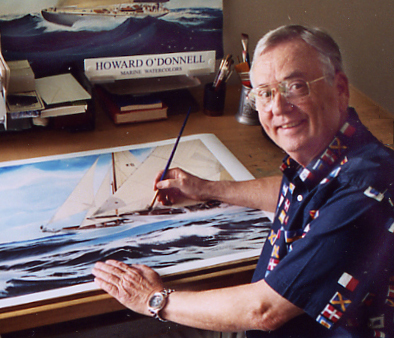 Howard O’Donnell was raised in a small Ohio farm town, where his love for art and sailing began. He attended the Chicago Academy of Fine Arts and Chicago Art Institute where he learned the basics of advertising and illustration. He then headed for New York where he was a free-lance commercial artist and illustrator, while also retaining employment in advertising. It was there that he worked with some of the world’s finest artists and honed his illustration skills. He then moved on to Southern California seeking a warmer climate and better opportunities. California offered year-round sailing and booming growth in the advertising field. Howard continued his work there in commercial art and advertising for more than forty years and owned a studio and agency for most of that time. Since then he has moved to watercolor as a natural progression from his illustrative past, has studied watercolor technique under the tutelage of Wayne Bender and has attended watercolor workshops with Tony Couch. As an artist, Howard has dedicated himself to marine art. Over the years it has been his pleasure to portray the sea, ships, and people who make their lives a part of it all. When he scrutinizes the action of a yacht race, he does so through the eyes of a trained artist and yachtsman who has owned boats ranging from a 20′ catboat to a 36′ sloop. For six years he lived aboard his beloved 36′ sloop, Cho Cho San, which he raced in the Ensenada regatta annually and cruised the Southern California coastal waters extensively including the crystal blue waters surrounding Catalina Island. His continued years of experience racing everything from Lido 14’s to a 45′ Bluenose schooner have allowed him to create exciting paintings that capture both the spirit and precision of today’s yachts and racing as well as historically inspired scenes of tall ships in port and at sea. Combining a bold use of color and drama with unparalleled technical accuracy, Howard has distinguished himself as a premier marine artist and continues to astound his fans with his newest creations of Sail, Sand, and Sea.